The score begins with angelic vocals, slow and atmospheric, with a moderate beat piano. It’s followed by an Irish pagan feel. A chord sequence on the piano with a wider string sound turns melancholy for 'My Sanctuary'. A Piano with reverb string backing is joined by occasional angelic vocals. 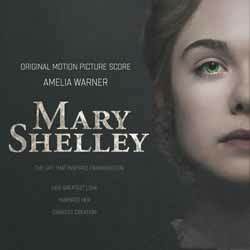 In 'Mary’s Decision' harp and bell turns to a full orchestral piece which is very nice. Then comes a piano melody which is taken over by the string section. 'It’s Time We Left This Place' is a very atmospheric piece using a simple bell/xylophone sound. An ambient mood piece, wherein instruments fade in and out, precedes a three-note tune in 'Bloomsbury', which is played around the edges by piano and strings and which goes to full orchestra, before returning to its simple beginning. 'Mary Meets Percy' exudes revelation, happiness and a little foreboding. An earlier melody is then given a faster pace. 'Caged Bird' has a curious Wurlitzer sound with bells in what comes across as a carnival effect. I have to say that 'Mary’s Nightmare' and 'The Book' are wasted opportunities. The former builds its momentum, but is rather restrained when you consider that this is where one of the greatest ideas in literature came from. The latter is very emotional but is still a repeated theme from earlier in the score. In fact, the last few tracks pass with a whimper. 'Clara' is, again, a longer version of an earlier track. This is a game of three-thirds, rather than two-halves. I was impressed by the inventiveness and diversity of the first two-thirds. The score is melancholy and soothingly takes you to another place, attempting to tug at the heart strings all along the way. It comfortably puts you in another time. It would have been nice if the tracks at the end took it in a completely different direction musically, and built to more of a crescendo. But you can’t have everything, so I’ll say on the whole this is a good solid soundtrack.